This is a common, widespread, wood decaying, bracket fungus. It fruits in the spring and persists through the summer or fall. It is found in rows, dense overlapping clusters, or rosettes on dead logs or stumps. It is saprobic, occurring on logs and stumps of dead hardwood trees, especially oaks. The fruiting body is a small to medium-sized, unstalked bracket. The bracket is circular, semi-circular, fan-shaped, or kidney-shaped. It can be ¾″ to 4″ in diameter, but is usually no more than 2¾″ in diameter. It is leathery and flexible when fresh, becoming rigid and less flexible when dry. The upper surface is dry and velvety due to a dense covering of fine hairs. It is variable in color with narrow, alternating, concentric bands of white, gray, brown, yellowish-buff, reddish-brown, or black. It is also variable in texture, with alternating hairy and silky smooth zones. The margin is white or creamy when the cap is actively growing. The underside is white to yellowish and densely covered with spore-bearing pores. The pores are minute but visible without a hand lens. There are 3 to 5 pores per millimeter. The spore tubes are no more than 1 ⁄16″ deep. The flesh is tough and leathery. The spore print is white or yellowish. False Turkey Tail (Stereum ostrea) usually forms individual brackets that do not fuse into rosettes. It is often orange above. The underside is smooth to slightly bumpy with no pores. Smoky Polypore (Bjerkandera adusta) is usually weakly zoned in shades of gray and brown, sometimes not zoned. The margins turn brown to black on mature and older specimens. The pore surface on mature specimens is smoky gray to blackish. 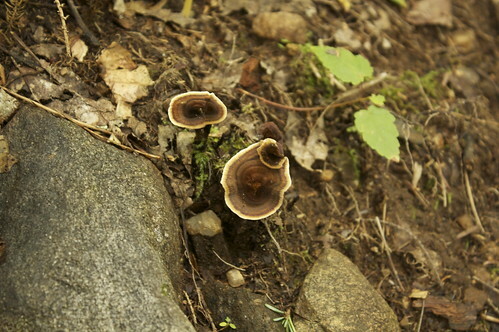 This is the most common polypore and one of the most common mushrooms in North American woods. Please comment, share, like and subscribe: http://www.youtube.com/user/Earthwalker40 then check out http://www.blogger.com/profile/16589694922742883622 These Turkey tail mushrooms, Tramates versicolor, Coriolus versicolor were found on hardwood on 9/30/2012 while fall mushroom hunting in SW Ohio. Turkey tail is a member of the medicinal mushroom group, and is a polypore which grows on wood. How to find turkey tail mushrooms. 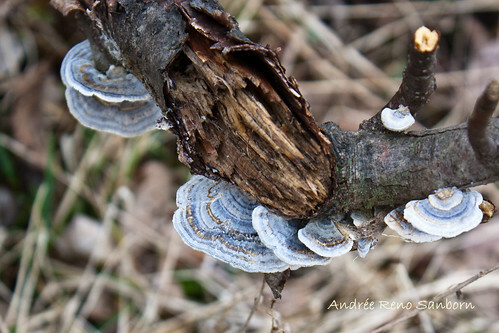 How to find Trametes Versicolor, Turkey tail mushrooms. http://www.youtube.com/user/Earthwalker40 then check out http://www.blogger.com/profile/16589694922742883622 This is a nice flush of Tremetes versicolor / Turkey tail / wild medicinal mushrooms found in the hardwood forest of southern Ohio. These wild medicinal mushrooms are members of the Polypore family. Mushroom hunting is an exciting and healthy pastime. How to find fall wild medicinal mushrooms. An afternoon spent in the forest provided some incredible medicinal mushrooms to take home! The forest itself listened to my intention and offered this majestic medicine in a truly magical way!